Close to the official closing of the ballot boxes, there were still long lines all polling stations. 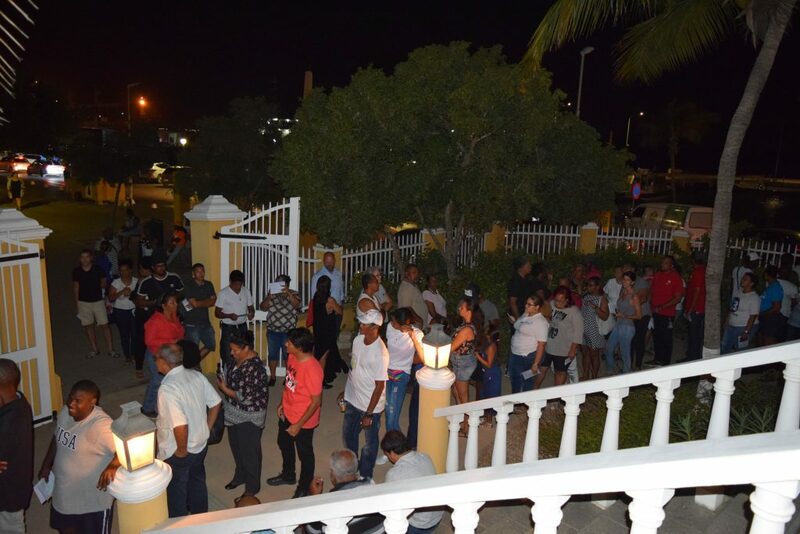 Seen here are voters lining up at the Passangrahan in Kralendijk around 8.15 PM. Photo: BES-Reporter. Kralendijk – Voting on Bonaire was off to a slow start today. At 7PM, evening, just under 39% of voters had actually cast their vote. At 9 PM, when the ballot boxes had to be officially closed, there were still long lines of voters at all polling stations. Voters who were already in line at one of the 10 polling stations at 9 PM were still able to cast their votes. The gates at the polling stations were closed by 9:00 PM, by order of Lieutenant Governor Edison Rijna. Voters who were not yet inside the gates were no longer allowed to enter. The long lines may have had a significant effect on the total number of voters who have used their voting rights today. It was not immediately clear what exactly caused the long queues, but the use of laptops in the identification of voters seemed to have been a delaying factor. Where voters in the early morning hours hardly had to wait to vote, in the afternoon voters often had to wait around 30 to 40 minutes. According to employees one of the polling stations, there were voters who had stood in line for 2 hours to cast their vote. There were also voters who, on seeing the long lines, gave up completely. In spite of the long lines, the atmosphere at most polling stations was excellent. Voters had a chat with each other, or with one of the candidates who were present at every polling station. The mobile polling station also saw many voters. Between 7 and 9 PM the the mobile polling station was present at the Passangrahan and that immediately led to a long line there also.